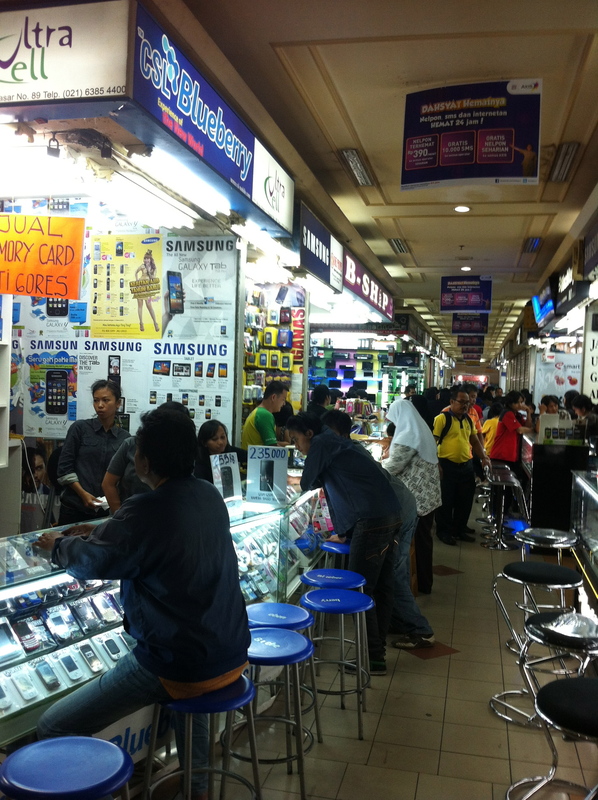 How mobile phones are sold in Indonesia? Mobile phones in the US are typically sold at retail locations owned by service providers where highly trained sales people guide the users to buy a heavily discounted phone with 2 years contract. As an example, unlocked iPhone 4S retails at $650 while the price with 2 years contract is $199. With 2 years contract and the most basic phone and data service, AT&T can collect $60/month for 24 months which comes out to $1440. After taking into account the $450 discount for the phone, AT&T will be able to make $1000 for 2 years per subscriber. Postpaid service is extremely limited as I mentioned in my previous article. So the US distribution model of selling mobile phone service does not work. Prepaid service decouples sales of mobile phones and mobile phone service because the mobile phone you purchase can work with multiple operators. People can first purchase the mobile phone and then choose the operator(s) they want to use by simply obtaining a SIM card with new phone number from their operator of choice. Therefore there is a separate market that just sells mobile phones regardless of operators. Operators never developed expertise in building nation-wide retail network because this is not how their service is sold. It is estimated that only 10-15% of mobile phone service sales are generated from operators’ direct sales force (through trade shows, kiosks, and some other retail presence). However, the rest of sales are done via dealers and mobile phone distributors. There are a few large mobile phone distributors that are publicly traded such as Trikomsel and Eraphone. 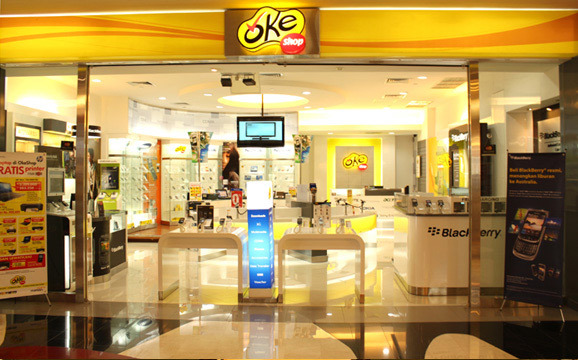 As an example, Trikomsel is one of the largest and operates 800+ retail stores all over Indonesia. They own some stores and partner with major grocery stores, general merchandise stores, and convenient stores. In addition, they are also a major phone distributor for 10,000+ dealers and retail stores. They generated annual revenue of USD ~$600m in 2010 with thin net profit margin of 2-3%. Roxy Mas trade center in Jakarta is the largest mobile phone trade center in Indonesia with roughly 30% of aggregate mobile phone sales in Indonesia (retail and wholesale). The trade center building hosts thousands of mobile phone retail stores selling a variety of mobile phones. This may sound peculiar for someone from the US who could not begin to think how thousand of stores selling almost the same goods can survive. This is how trading works in Indonesia. Each product category (lamps, bulbs, cell phones, fabrics, clothing, etc) have a trade center location where each building hosts thousands of similar stores. People living in Jakarta know that these are the places they need to visit to get the best deals and lowest price on each product category. For example, people would tell you to go to Tanah Abang trade center for fabrics or Kenari trade center for lamps. Each store in Roxy Mas trade center is about 9 ft x 15 ft and costs about $12,000/year to rent. Most of the owners operate their own stores and compete based on price, references, and reputation. They work very hard 7 days a week to serve their customers. Due of the size of demand for Indonesian 240m+ consumers, if they can average 10 mobile phone sales per day with $10 profit each, they would have made $500 net profit per month after lease. The rest of the cost is extremely small. The store owner generally gets the most profit when there are wholesale deals. Once a mobile phone is sold at one of these retail stores, the sale is typically completed with an activation of a mobile phone service from one of the operators. Mobile phone service is selected based on completely different metric such as perceived network quality, speed of data connection, how many friends/families I have on that operator’s network (to get free calls), and call/sms/data tariffs. These stores are agnostic as far as which operator gets the sale. Sometimes, they will push whatever operator is running a distributor promotion that would allow them to get rebate. They sell a variety of different phones with almost no promotional incentives from OEM – they will try to stock whatever product is in demand. Blackberry products have become dominant mobile phones in Indonesia recently (I will write more on this). RIM does not need to spend any marketing promotion dollar to advertise the Blackberry brand. 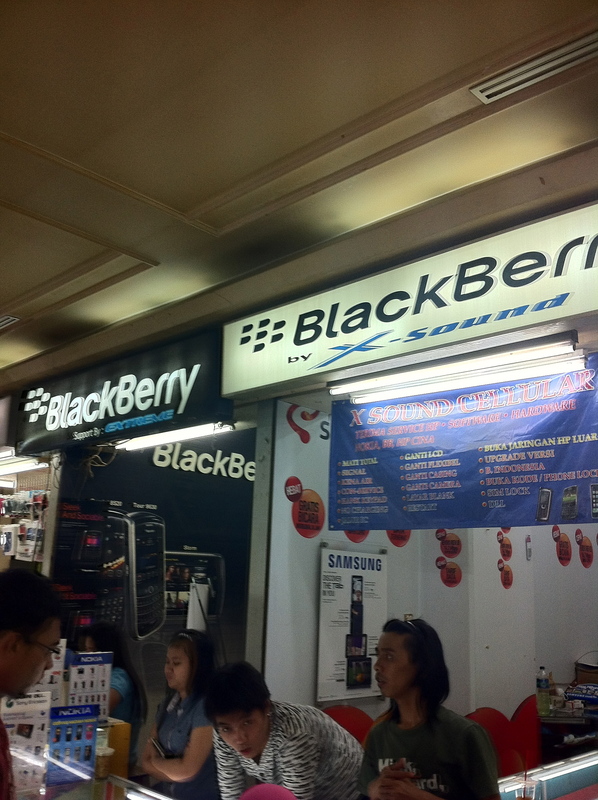 The store owner actually promotes Blackberry on the store’s sign to attract customers.